Hello all! I would like to take a quick moment to thank you for supporting my vision. I had no idea it would be so well received! I want you to remember that volunteering for the home tour project does not mean you have to have shiny floors and a weed free garden. Beyond the connection that we have in our community we are living lives that are full of errands, cleaning, work, budgets, kids, pets, more work, volunteering and board meetings, just to name a few. I want you to keep in mind that I only have the desire to capture real life. When I had to document our home this past spring for a magazine shoot Sahid and I got a 6 pack of beer gathered up the kids and went from room to room cleaning it together. It was the ONLY time our home would ever be that clean and organized. We enjoyed seeing it that way and it didn't take long for it to clutter and collect stuff. I want this project to continue to flow as organically as I can do it. With that being said, I would like to introduce you to my next home tour. Shawn and Lauren Wright. I recently met them after they reached out to volunteer for this project. I am so happy they did! I have really enjoyed getting to know them during the process and I love their passion for the history they have learned about the place they call home. I hope you all ENJOY! Our home was built in 1890 as a small 5-room frame house. Over the past 125 years, it has been remodeled many times and has grown to the nearly 4400 sq ft home it is today. The original 5-room dwelling was built in 1890 by J.W. Bryant and his wife Mary Ann Legg Bryant. J.W. Bryant was the town’s only mortician until around 1912. He and his brother Ben also operated Bryant Brothers Hardware store located on South First Street in Downtown Rogers. He was also one of Rogers’ first masons. Mary Ann Bryant raised their 5 children at the home. One of her hobbies was gardening in her yard and she loved flowers, of which she had many beautiful and rare specimens. The home remained in the family and was home to the youngest daughter, Marjorie Bryant Carter until her death in the 1980’s. Shawn grew up minutes from downtown Rogers in a house his father still lives in and has since 1967. He spent his summers riding his bike downtown and swimming in the pool and splashing in the creeks around Lake Atalanta. Downtown Rogers will always be a special place for Shawn and he was very excited to move closer to the downtown area after living in the southwest side of town for the past 8 years. Lauren grew up in Bentonville and we are both proud to call ourselves natives to the area. We’ve always loved the unique style and history that comes with a historic home and decided to take a chance on this one. Did you make any additions/floor change/upgrades to the home? If so, feel free to share your sources and/or process of them. The majority of what we’ve done has been cosmetic as the previous owner had already updated the home’s electrical, plumbing, etc. 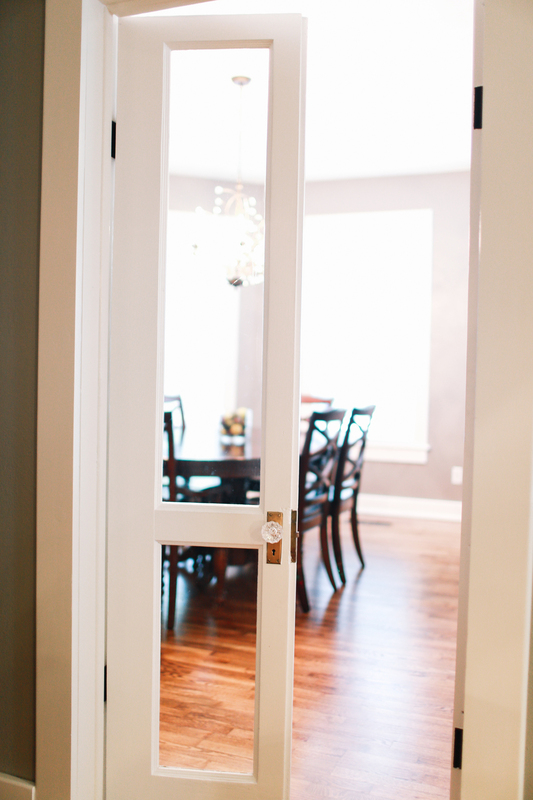 We removed two walls to open up the living and dining area. We painted the entire downstairs as well as the exterior trim and dormers. We are fortunate to have original wood floors in several rooms and had them restored and refinished in a dark walnut stain. We also refinished the staircase in dark walnut with white painted risers. We remodeled the kitchen in March of this year. 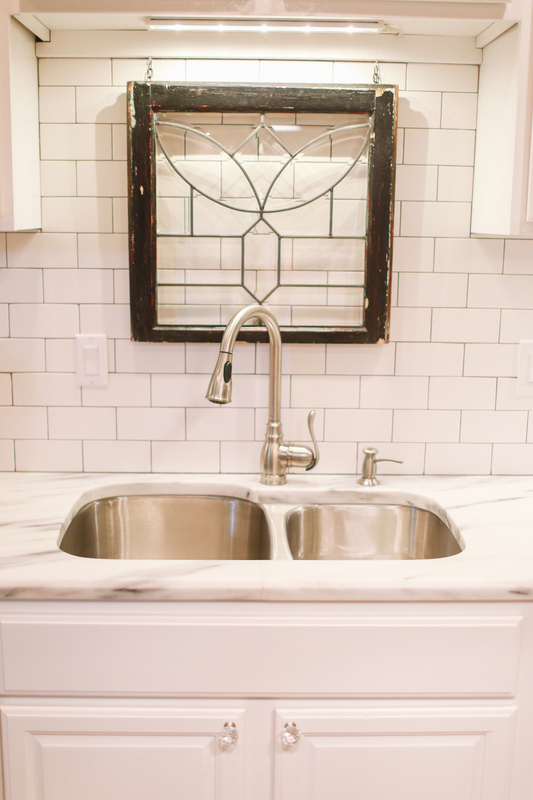 Lauren had always wanted a white kitchen so we chose a beautiful white and gray Royal Danby marble for the countertops with white subway tile and contrasting dark grout for the backsplash. We also added a butcher block top to the island and laid new tile flooring. We added recessed lights and replaced the majority of the light fixtures downstairs, excluding the original fixtures, which based on their design, were likely added in the 1920s. Mike Johannsen of Johannsen Construction did the kitchen remodel as well as new tile and vanity for our master bath. We highly recommend him for any remodel work! We plan to begin renovations on the upstairs later this year. 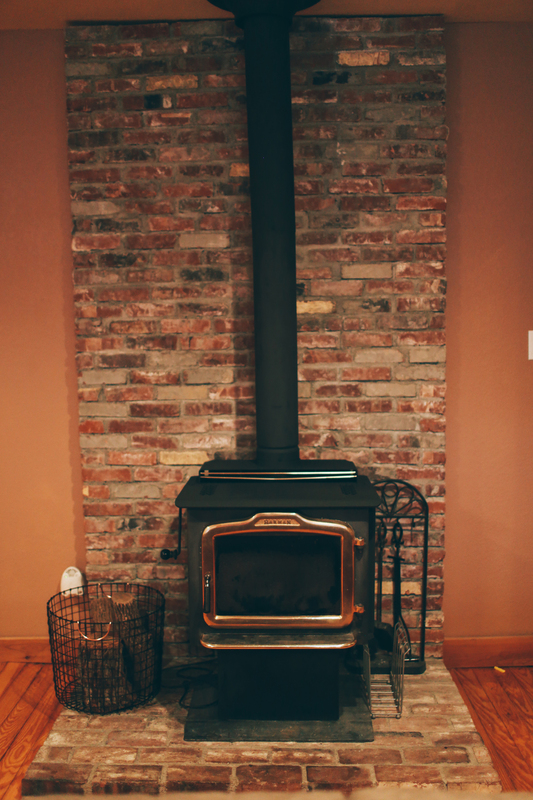 Name a couple of favorite pieces in your home. 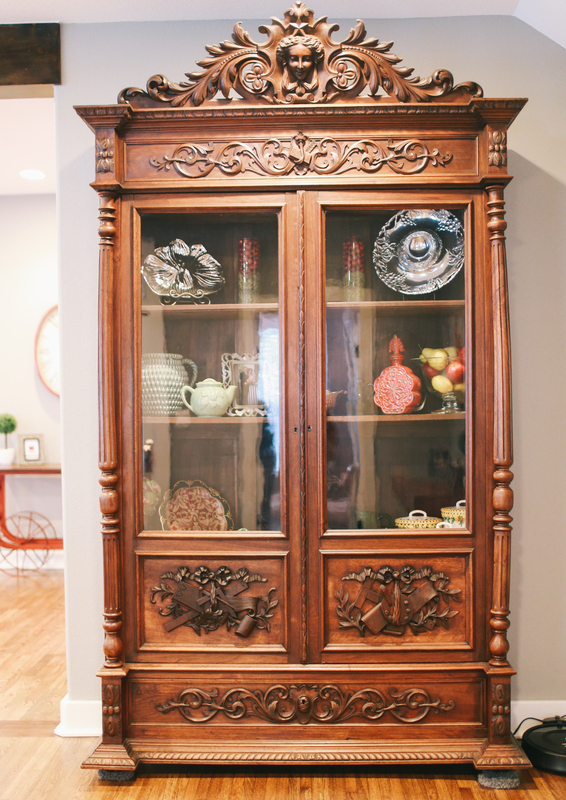 We have a mason’s cabinet from the late 1800’s that has incredibly intricate, hand-carved wood detail. There is a beautiful sundial in the yard that we believe is original with “Let others tell of storms and showers. I’ll only mark your sunny hours” etched into it. Another favorite is a window pane that hangs over our kitchen sink that was a part of Lauren’s grandparents’ furniture store in Harrison, Arkansas. 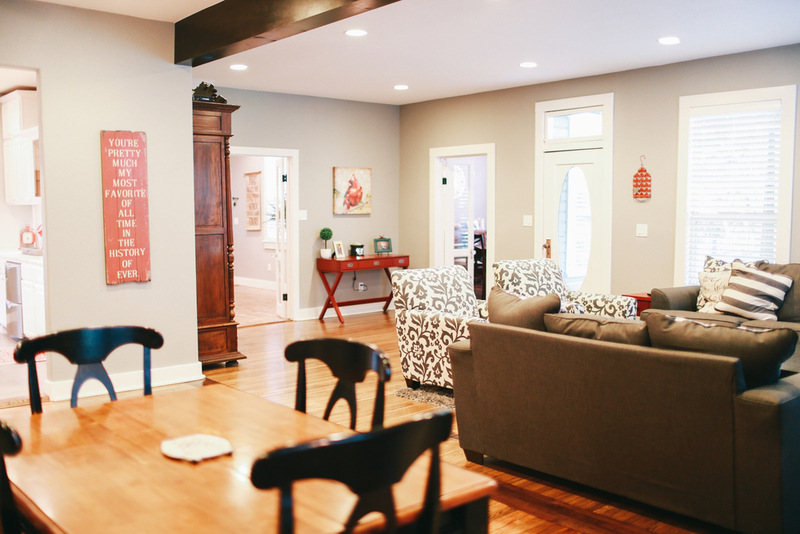 Shawn fell in love with the home the first time he walked through it. The history and unique charm that comes with a historic home like this cannot be duplicated. We had been looking for property to build a house on when we stumbled upon this one for sale. The beautifully landscaped yard with its many flowering plants is what most attracted Lauren to the property, especially the rows of peonies. We’ve been surprised by several beautiful flowers popping up that we didn’t even know were here. Flowers like bearded Iris, naked ladies, several types of roses and an exotic Hellebore plant. Lilac, magnolia and jasmine fill the air with wonderful fragrance from spring through summer. The crowing jewel of the property is a magnificent post oak that one arborist estimated to be between 200-250 years old. We have two boys, Grayson (6) and Keaton (2), a dog named Yadi and we all absolutely love the location. We walk downtown for dinner at The Rail or Parkside and are excited about the new shops and restaurants that are opening downtown. One of our favorite things to do is walk to the Farmer’s Market every Saturday. We are really looking forward to Lake Atalanta reopening and Shawn hopes the downtown area becomes a special place for his boys the way it was for him growing up.